The Department for Education is urgently seeking to “improve understanding” of what’s behind the drop in level two apprenticeships, as the latest statistics show numbers have fallen by more than a third in the space of a year. There were just 161,400 starts at level two in 2017/18, according to the final apprenticeship figures for the year, published today – down from 260,700 in 2016/17. 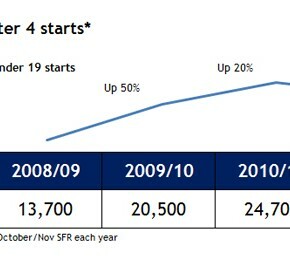 The proportion of overall starts at level two has also fallen to its lowest level yet – from a high of 65 per cent in 2013/15 down to 43 per cent in 2017/18. It follows the DfE’s publication yesterday of a call for expressions of interest to carry out research to “improve understanding of the causes and effects of changes to the number of apprenticeship starts at level two”, with a deadline of December 18 – suggesting the department is concerned about the fall. “Level two starts are now the biggest issue we face,” said Mark Dawe, chief executive of the Association of Employment and Learning Providers. “We want apprenticeships to grow at all levels, but major mistakes in the implementation of the levy have resulted in a serious undermining of the government’s social mobility agenda,” he said. Earlier this week Ofsted chief inspector Amanda Spielman hit out at the rise in “existing graduate schemes” being “rebadged as apprenticeships”, at the expense of the “third of students who leave school without a full level two”. According to the call for expressions of interest, the fall in apprenticeship starts in 2017/18 compared with previous years “has been greatest at level two”. Analysis of data shows the decrease is “most pronounced in four sector subject areas: business, administration and law; health, public services and care; retail and commercial enterprise; and engineering and manufacturing technologies”. “New research is required to inform the department’s understanding of the factors affecting changes to apprenticeship starts at level two and the interplay with starts at level three, and to inform the policy response to this change,” it said. Among the aims of the project are to “explore whether lessons can be learned from exceptions to the overall trend” such as where employers within the four subject areas “are in fact increasing level two starts”, and to “identify possible policy responses to the overall change in numbers of Level 2 starts”. For many families, a school leaver undertaking an apprenticeship is too costly for them. The loss of child benefit and other supportive payments cannot be replaced with an average apprentice wage of around £115 per week when this has to pay for clothes, travel and other ‘going to work’ expenses such as having to provide lunch – there are no free school meals at work! Many level 2 apprentices have to take on a second job just to make ends meet, putting them at risk of dropping out. Until we put apprenticeships for new entrants into the workplace on a par with other 16-18 education pathways, we will continue to see reducing numbers of participation. What is behind the 100,000 drop in L2 apprenticeships?